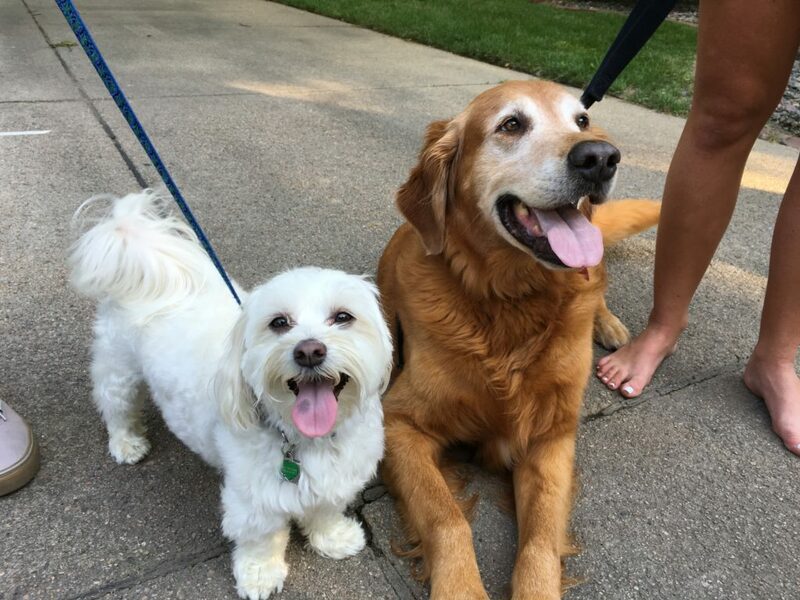 Lenny (left) is a four-year-old Maltese who lives in Omaha with Leo, a severn-year-old Golden Retriever. Their guardians set up a dog obedience training session with me to address Lenny’s marking in the house, help stop dog barking and get over Lenny’s fear of new people and experiences. The dogs did pretty good on the greeting although Lenny did try to jump up on me a few times. While they were a little bit excited, their energy was not out of control. When the G=guardian originally scheduled a session with me she said the focus was on Lenny’s marking in the house. She did not think that Leo needed any work but about 60 seconds after sitting down with the family, I spotted a couple of issues with him too. Because we love our dogs, we often overlook behaviors from them that would be inappropriate for anyone else to do. While there is nothing wrong with the dog being close to us, there is nothing wrong with a little personal space. To dogs, distance equals respect. Plus if a dog has to be on us all the time or is physical with us, it usually is an indication of a lack of respect for us as authority figures or an insecurity. Just about every client I have had who’s dog marked in the house did not have a lot of structure in place for their dog. This gives the dog the impression that they have the same or more authority than humans. If the dog thinks it has more authority than you do, then they feel that the house is theirs. When you have multiple dogs that live together, if they don’t perceive you as the leader, it’s quite common for them to try to mark things inside the house to assert themselves. I suggested some rules that the family can incorporate as well as a set of escalating consequences they can utilize any time the dog breaks one of the new rules. I also went over a technique that I developed a few years ago called petting with a purpose. Its a form of positive dog training that works extremely well. Basically you pet the dog when it does things you like. Many people don’t realize how often they pet their dogs. While I would never say that petting your dog is a bad thing, too much of anything lessens its importance to us. Additionally, adding a little bit of structure to the petting exercise can go a long ways towards building up your dogs respect for you as an authority figure. Another activity that is usually handled by an authority figure in a dog pack is security for the group. I spent the next couple of minutes going over how the guardians can use the escalating consequences that we introduced earlier to claim the area around the door and control the greeting. I recommended that the family members call or text one another when they are coming home for the next week or two. By parking their cars on the street, texting whoever is in the home to alert them before hand and then knocking on the door as if they are a guest, they can help each other practice this exercise without the added pressure of an actual guest waiting at the door. Another great way to assume a leadership role in the dog’s eyes is to make sure that they are in a follower position while on a walk. To dogs, whoever is in front is literally in the leadership position. Because both dogs pulled on the leash and liked to try to walk ahead of the humans, I pulled out a couple of Martingale collar’s and then showed the humans how to apply a special twist of the leash to stop them from pulling. I shared my rules for a structured walk and then we headed outside so that I could demonstrate the proper structured walking technique and do a little leash training. The guardians were quite pleased with how well the dogs did using the new Martingales. While the leash and collar set up went a long ways towards better controlling the dogs, we also spent several minutes inside pausing and waiting for the dogs to calm down before we actually exited the home. This is crucial. The energy your dogs have in the house is the same they will have on a walk. So starting out when the dogs are calm really puts both of you in a position to succeed. By the end of the session, the dogs were starting to show respect for the human’s personal space, however Lenny kept testing the resolve of his guardians and the new rule of not being allowed on the furniture. This is one of those “who blinks first” situations. If the guardians are consistently disagreeing with the dog the instant they jump up on the couch, or preferably before they get there, it shouldn’t take long before the dogs realize that the humans are not going to give up. But if the humans are late in their disagreements or don’t consistently enforce these rules it’s can be very challenging to get Lenny to keep staying on the floor. I suggested that if Lenny breaks that rule more than twice or gets too close to the humans while they are eating (another rule), that they put him on a leash and tether it to a chair leg across the room as a consequence. If they are consistent, he will learn to behave the way they want to avoid that consequence. The good news is both dogs responded very well to the new techniques that we introduced during the session. It’s going to be up to the humans to use these new techniques and exercises and to correct their dogs consistently with good timing in order for them to completely transition into the follower mindset. Once Lenny no longer identifies as being in the leadership position, his days of marking things inside the home should quickly come to an end.